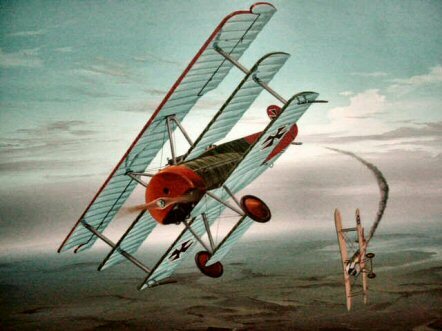 DESCRIPTION: Here is a great artistic rendering of Manfred von Richthoffen, the Red Baron, 1892-1918. 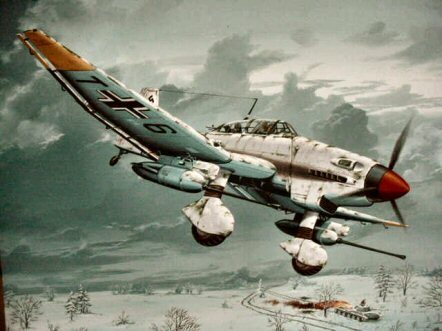 This hero of the skies was noted for his high number of aerial victories (80 kills). 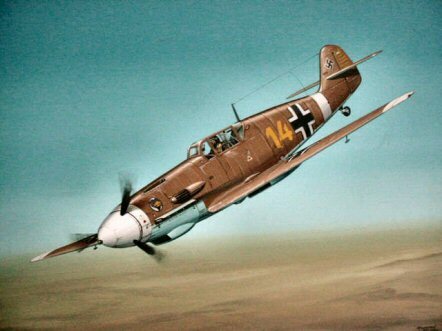 He first joined the Uhlans (cavalry), later, the fledgling German Air Force and eventually became the commander of the 11th Pursuit Squadron more commonly known as Richthoffen’s Flying Circus because of its highly decorated scarlet aircraft. 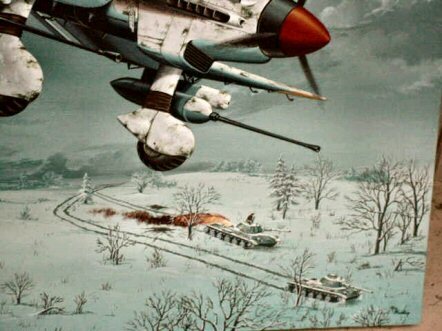 Here is the Rittmeister in action in the skies brilliantly depicted in oil by famous combat artist Ray Waddy. The colors are vibrant and the action seems live because of the extraordinary detail produced by Waddy. 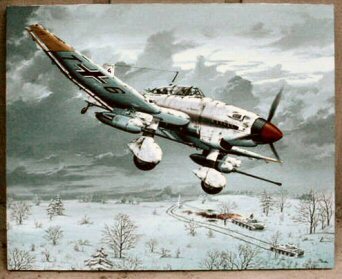 This is one you would be proud to hang in your den or collection room. It measures 30 x 24 inches (a nice size). There is no better an artist in this media than Mr. Raymond Waddy. DESCRIPTION: This is going to be a brand-new experiment on our part here at Germania International, LLC. We have recently come across an artist that is positively the best! His paintings of people would practically breathe. The fabric of the clothing looks like you could run your hands on it and it actually seems like cloth, or so you would and could easily imagine. Leather looks like leather. 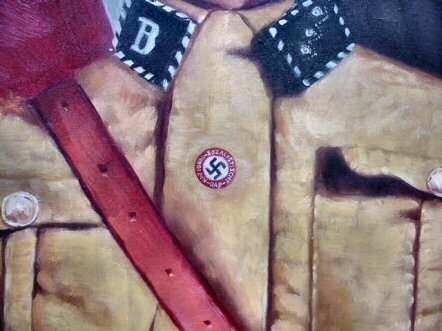 The essence of art in the National Socialist period was “realism” and this master painter has certainly carried on that tradition. Please try to understand my sincerity when I say that paintings by this artist could have hung in the Haus der Deutschen Kunst in Munich. They are actually and truly that good! Having had art training and having handled art for four decades, I believe I could be a judge of what is excellent portrayal. We will offer more of these fantastic pieces in the coming months and in some cases we can take orders from you for favorite subjects of yours to be specially ordered. 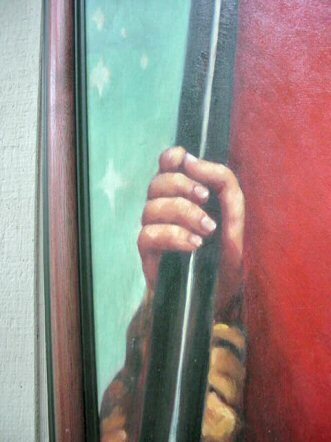 We start with this beautiful depiction in oil of the SA man with the banner. 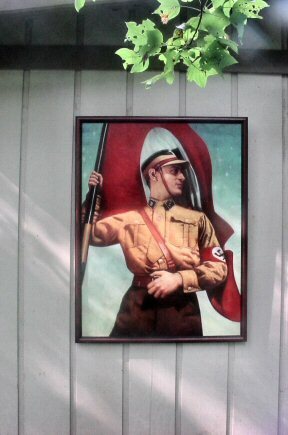 It was taken from a film poster advertising the 1930’s film, S.A. Mann Brant, which was practically a tone poem of sorts evangelizing the life of the young martyr Horst Wessel, who was cut down by a communist thug and became the national symbol of heroism. He wrote the song that became the anthem of the NSDAP, Die Fahne Hoch, Raise the Banner. Certainly our artist has raised the banner here in this fantastically executed depiction that artistically excels even the original poster. Note the stars in the background symbolizing the NS adage. The man may fall , but he flag, never!. Germanophiles will catch that meaning. 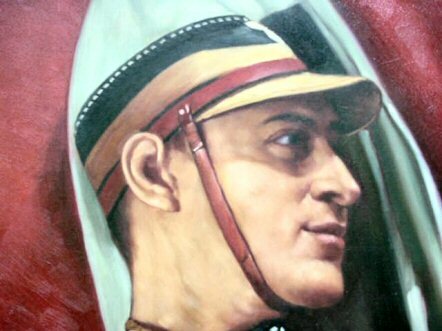 This is a very large portrait measuring 51 x 38 ½ inches. 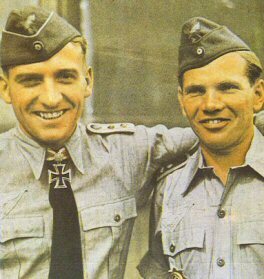 The collar tabs and cap piping show that this storm trooper is attached to the Berlin Sturm of the SA as was Horst Wessel, himself. 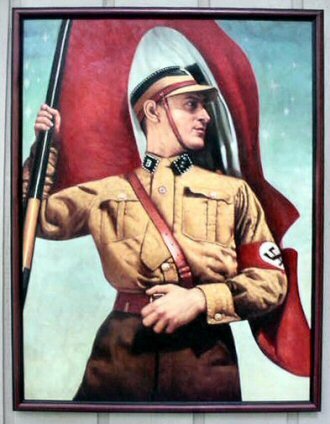 The vibrant colors and clean, detailed lines of this portrait make it an utterly fantastic addition or centerpiece for an excellent collection of Kampfzeit articles. Watch for more offerings in this line of artwork. Shipping and framing of this rendering were considerable, but we are offering it at a very reasonable price, considering all. DESCRIPTION: Here is a great colorful poster that is a direct copy from an original. 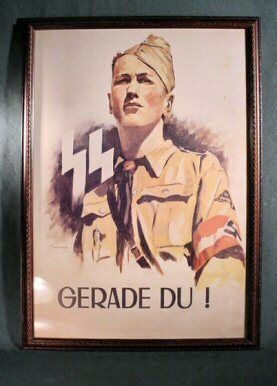 It depicts a Hitler Youth lad, who stands in front of the SS flag with the words “GERADE DU!.” That seems to translate to roughly “Forward with you!” In other words, step up to the Waffen-SS! It’s in beautiful color and portrays fine perceptive feeling.